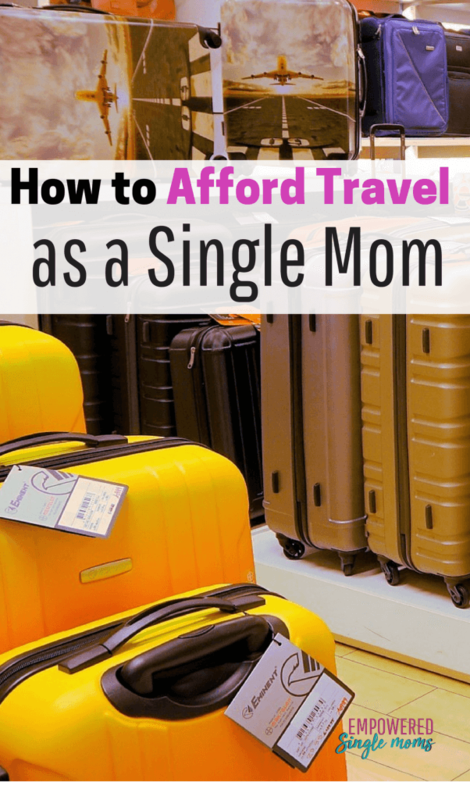 How to afford travel as a single mom is something many of us wonder. You need to pay the rent/mortgage, buy groceries and clothes, heat the house, and pay for seemingly unending activity fees for the kids. But sometimes, you just need a little getaway. It doesn’t have to be a month-long trip to Brazil. Even a weekend trip provides a refreshing change of scenery. 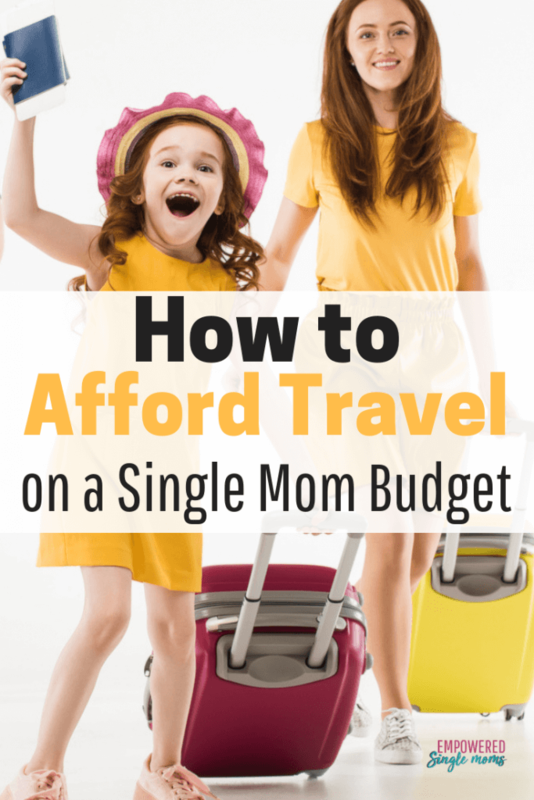 Yes, you do need to make some room in your budget for travel, but there are a few ways to make saving on travel relatively painless. Camping is an adventure. One of my favorite places is the Boundary Waters Canoe Area (BWCA) in Northern Minnesota. I received lessons about peace there. In much of the BWCA, camping is your only option. A permit is inexpensive and the camping is free, so you cannot do much better than that. I know a few people who take solo trips to the BWCA, but I prefer a travel partner for those trips. All of these options are budget friendly, but state forests are the most economical camping option. There is usually a small fee when you camp in a designated campsite, but you can camp in an undesignated site for free. Visiting friends and family is a terrific way to fulfill a desire to travel. Maybe you can cook dinner or buy dinner in exchange for sleeping in their spare room or on a patch of empty floor. It is also a great way to connect with friends and family you do not get to see very often. Travel with friends or family to save money. When my kids were younger, my sisters and I would have what we called sisters trips and the kids called cousins trips. We all lived in different states, but these trips were opportunities to make memories together. When my parents celebrated their 50th anniversary, their kids and grandkids joined them in a favorite family vacation spot. We even had our kids recreate a couple of photos from our own childhood. I have had some great trips reconnecting with my college roommates. Sharing a room costs much less than having your own room. Do you have a friend you want to spend time with or someone you have lost touch with what you want to reconnect with? It might be an opportunity to meet them someplace in between where the two of you live. There are several websites for bidding on a room or finding cheap rooms. Two of my favorites are Priceline and Hotwire. I have saved hundreds of dollars by using those two sites to find hotel rooms. I have several friends who have had great experiences with Airbnb. Don’t forget to check your credit card perks. Many cards offer the opportunity to earn free travel. Sometimes resort areas offer two or more free nights if you listen to a pitch for a time-share. If your kids are old enough to be on their own for a couple of hours, this is a great way to get a free place to stay (just do not buy anything that is not in your budget). After I heard the pitch I really wanted to buy in, but it was not in my budget at the time. You can often earn free nights by being loyal to a particular hotel chain. Doing a little research before booking may pay off. There are several credit cards that allow you to earn points and get free airplane tickets. Just be sure to pay off your balance in full so that you are not paying high interest rates on a credit card. Some cards are more flexible and you can earn a free night’s stay too. Riding on public transportation is an opportunity to see what a different city is like. Try the bus or commuter train. Many cities have free bus service downtown, but a bus ticket is usually inexpensive. Be aware of where you are going and if it will feel safe for you to travel in that part of town or wait at the bus stop. Daytime is a better time to take the bus than after dark unless you are very aware of the neighborhoods and safety. Hotels often have free shuttle service to popular attractions. Recently when I was staying in downtown Denver, I had the option of getting a ride from the airport in a hotel car for $60. When I asked about other options, I found I could take the train from the airport to the downtown station for $9 and then ride the free bus to the hotel. That was a total savings of $102, not including a tip that I would have given the driver. Uber and Lyft are affordable options in urban areas. Many cities are walkable. You save money and get good exercise while getting a feel for the city. Don’t overlook the bike trails. Find out if there are bike paths or hiking trails were you will be staying. National and state parks are obvious places to do this, but the town where I live has a bike path around the lake, which is a pleasant way to spend some time. You will likely have your pick of bike rental options if you don’t bring your own bike. Not only is foot- or pedal- power an economical way to get around, it is a fun experience in itself! If you are not familiar with the area, be sure to have your phone powered up and/or carry a map. Look in the local newspapers or online events calendars to see what is going on in town. Attending an outdoor music concert is a pleasant way to pass a warm summer evening. Going out for dinner? Stay for the entertainment! When you look for a place to dine, don’t overlook special events. If you like bands, dancing, trivia, or karaoke, your whole evening’s entertainment could be the cost of a meal and/or drinks. Do you enjoy treasure hunts? Puzzles? Walking around in circles? Geocaching is an international treasure hunt and it is free. Practically anywhere you travel, geocaches (hidden containers with a log to sign and/or treasures to trade) are waiting to be found. Each cache is different and could be hidden just about anywhere. You can load a geocaching app on your phone, make an account for free, and see what is nearby. Be sure to bring a pen. Many towns have sculpture walks, which are fun to see and make great photo ops. Self-guided history tours are another interactive way to learn more about where you are. State capitol buildings have interesting art and history displays. Old churches are often open to the public and have fascinating architecture. Look for what is unique in the place you are visiting. For example, the world-renowned Mayo Clinic in Rochester, MN has a self-guided art tour. On a recent trip, I saved over $50 by visiting sites on free days. Choosing the free activities can bring you to places you might not have otherwise visited. This works out perfectly because whether you have a great experience or not, you’re not out anything. Many museums, amusement parks, and other sites often offer reduced admission–you just have to bring the coupon. There are several places to find these coupons. There are several coupon apps, in the city guide online or the print version can often be requested ahead of time or be found at the hotel. Simple cooking can be cheaper than planning to eat out. 22. Factory tours can be fun, or creamery/winery/brewery tours. They are usually free and include samples. Great if you are taking the kids with you and they get to see the people and machinery in action. There are multiple festivals and most of them have some free exhibits or activities. Check out the visitor guide for the area to find out when there are festivals scheduled. There are huge festivals where the hotel rooms will be booked almost a year in advance and rates will be at a premium. However, there are lesser known festivals that are very interesting and when room rates do not spike and campsites can be reserved. Some examples in my area are a blueberry festival, a wood carver’s festival, a couple of chainsaw carving festivals and town-wide garage sales in a couple of the very small nearby towns. Groceries stores and grocery store delis are economical, and if you make some smart choices, the food is healthier than if you were to eat at a restaurant. If your room has a refrigerator, you can buy healthy snacks and some special treats for the whole week and skip searching for restaurants. Food trucks give you the excitement of trying new foods, and they are cheaper than sit-down places. They also have more personality than fast food restaurants or other chains. If you take your meal to go, you can buy your own drinks. Speaking of drinking, you can drink water for free. Staying hydrated is an important part of ensuring a safe and fun vacation. Invest in good refillable water bottles and you will not only avoid using disposable bottles, but you will save a ton of money at gas station stops. Camelbak Products Chute Water Bottle, Sage, 1-Liter is my favorite water bottle. Many people need to travel for work meetings or continuing education events if you do go a day early or stay a day longer and explore the area. This is a great opportunity to try Single Mom Solo Travel. 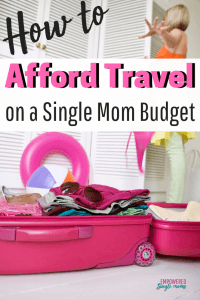 What is your favorite way to cut expenses and afford travel as a single mom? It would be so sweet of you to share your tips with us. If you found these tips helpful, please share this article, it means so much to me when you do.